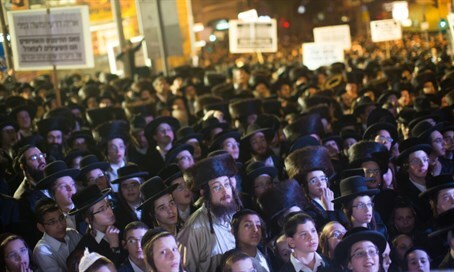 Hundreds of demonstrators attempted to disrupt speech by Rabbi Amnon Yitzhak in haredi city. Popular ‘kiruv rabbi’ and speaker Rabbi Amnon Yitzhak was scheduled to address residents of the haredi town of Modi’in Illit Monday night, an event that at first blush would seem unlikely to create such a storm of controversy. Yitzhak, a Yemenite-Israeli rabbi who has spent decades on the speaking circuit, has become a prominent fixture within the ‘hozrim be’tshuva’ (newly religious) community. In recent years, however, a number of public clashes with other leading religious leaders has left the haredi world sharply divided on Yitzhak. Rabbi Ovadia Yosef, the late spiritual leader of the Shas movement, condemned Yitzhak for his support of a rival party in the 2013 election. In subsequent years, other rabbis – including other ‘kiruv’ rabbis, have also been embroiled in public tiffs with Yitzhak. Rabbi Yossi Mizrachi, an Israeli expat living in Monsey, New York, and Rabbi Zamir Cohen have both found themselves at odds with Yitzhak in recent years in rivalries that have occasionally led to physical threats. On Monday evening, opponents of Yitzhak gathered outside of the Nof Illit event hall in the Brachfeld neighborhood of Modi’in Illit in southwestern Samaria. Hundreds of demonstrators reportedly attempted to force their way to disrupt a lecture given by Yitzhak, but security officials succeeded in preventing their entry. Protesters later sought to block Yitzhak’s exit from the event, though the rabbi ultimately succeeded in evading the demonstrators. Witnesses said that the demonstrators were primarily younger yeshiva students.